For the 16th year in a row, my sister and I decorated and donated a tree to our local children's hospital fundraiser through an event known as the Utah Festival of Trees. This year we actually donated 3 trees total, with 2 different scenes. 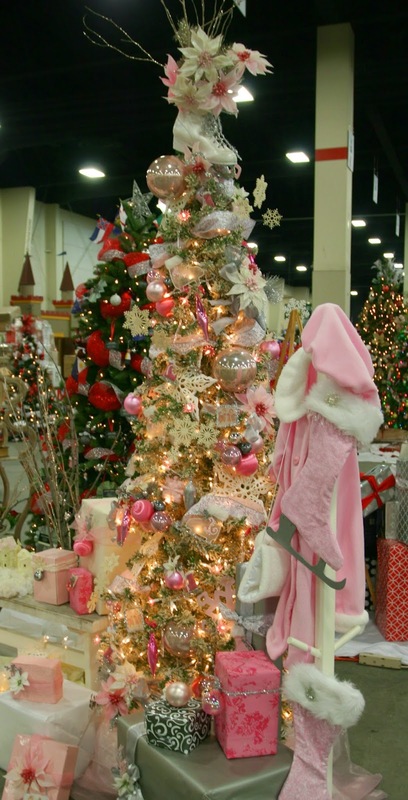 The picture shown above is the larger of the 2 pink trees in our scene entitled "Pretty in Vintage Pink". The theme is Vintage Ice skating and LOTS of pink tones. We also used cream, silver, and mercury. Our tree started with a donation of 2 vintage Trees that were flocked with the loveliest vintage shade of ecru flocking. Though it was a terrible mess to work with, it sure was pretty! Both of the trees were topped with a single skate from the pair. I decorated them with pearl paint and German Glass glitter on the blades, as well as tinsel ribbon, then filled them with some vintage plastic poinsettias and mercury glass pine and glitter twigs. My sister had a neighbor donate a giant box full of vintage ornaments from her aunt's house when she moved to a nursing home. They had been lovingly cared for and it was really fun to put them to use again. There were 2 types of plastic poinsettias included...more than we could even use! The pink ones were the right color, but the cream glittered ones had a red and yellow center. We popped them out and repainted them with pink glitter paint, plus we added extra glitter. Aren't they lovely? We had the box for a couple of years before we decided to use them. Since the previous 3 years trees had all been on the masculine side, last year I suggested that we do a very girly theme the next year. I found a vintage image of two young girls ice skating, and wearing pink coats, that was the inspiration for our entire theme. I copied the image onto transparencies, and then layered them with vellum before edging with tinsel ribbon to create a custom ornaments. With the light showing through, they became quite a lovely accent on the tree. One of the main things we made was ice skate ornaments. I designed these with some cast-off thick plates sheets (From my neighbors garbage can! I saw them sticking out and grabbed the stack of them because I KNEW they'd make great crafting material!) and then topped them with fur, gave them a glitter pipe cleaner blade and laces, and my sister finished them off with a filigree swirl finished with pink glitter. They turned out darling, and just like the skaters ornament, the light shines through them! I have more details to share on the individual photos, but will have to finish that up another time! I hope you enjoyed our little pink Skating tree! We dedicated it to a little 3 year old girl who has been very sick and is getting treatment at the hospital for which the fundraiser is held.